What benefits do you get with wireless keyboards with a touchpad? Wireless keyboard frees your life from the limitations of clumsy wires. They add flexibility to your work. Before that, I have a point to discuss. You must have seen people looking for wireless keyboards with the mouse or wireless keyboard with mouse combo. I mean why you need two separate devices when there are various wireless keyboards with touchpad available in the market. Be smart, make life less complicated with these best five wireless keyboards with touchpad or trackpad in 2019. These are simple all one in one keyboard. Not just for your PC, most of these wireless keyboard for smart TVs. Weighing just 0.86lbs/390gm( with batteries), Logitech K400 plus is a light wireless keyboard with touchpad. The compact and clean design of the keyboard is going to impress you in the very first look. You can also customize the touchpad and keys as per your wish. It is compatible with various platforms like Android 5( and later), Chrome OS, and Windows 7/8/10. It runs on two non-rechargeable AA sized battery. And offers you a long battery life of around eighteen months. This wireless Logitech keyboard comes with a one-year limited hardware warranty. This light, slim and compact wireless keyboard from ESYNIC is compatible with various platforms be it a laptop, PCs or smart TVs. Slim and light do not mean, it’s weak and feeble. Its backside is laid with stainless steel. And there is also rubber layering that makes it durable and shock absorbing. Its backside is laid with stainless steel. And there is also rubber layering that makes it durable and shock absorbing. The keyboard is fast and smooth in operation. It employs the latest 2.4 GHz Wireless Technology that provides an uninterrupted connection. The function keys can be used for multimedia control. The wireless keyboard supports touchpad of large size. Thus, you don’t need an extra mouse. It runs on two AAA batteries. The gadget is smart enough to save energy with its auto sleep and wake up properties. Logitech 400 is a prior version of Logitech K400 plus. It comes at a lower than that of Logitech K400 plus. There are certain differences between the Logitech K400 and K400 plus, but the considering factors like size of touchpad, connectivity technology and connectivity range is same in both. I mean both runs on 2.4 GHz wireless network that offers a range of 33 feet/ 10 meters. The size of touchpad is the same, 3.5 inches in both. So where the difference lies between Logitech K400 plus and K400? Logitech K400 plus is more media-friendly. You get various media short-cuts. K400 plus is programmable but, Logitech K400 isn’t programmable. K400 is compatible with only with Windows XP/7/and vista. While Logitech K400 plus is works well with Android, Chrome and Windows. Logitech K400 comes with a battery life of 12 months. While K400 plus offers a battery life of 18 months. You can make your choice accordingly. Both the keyboards are famous and trusted among the user. No doubt Logitech K400 is short of some features when compared with Logotech K400 plus, it’s updated version. But, again it comes at a cheaper price tag than the later. Microsoft All-In-One keyboard is designed for fun and work. It comes with various media hotkeys that allow you to surf multi-media, control video and audio. It smooth and seamless in operation. Not just fast, the wireless keyboard is secured with 128-Bit Encryption using AES technology. It offers long-range connectivity. You can roam around a range of 30 feet. You can use it on various platforms. Microsoft N9Z-00001 All In One wireless keyboard is compatible with Windows, Mac and Android. It’s quite durable and sturdy with its spill resistant design. The wireless keyboard from Microsoft is going to bear accidental spill and drops. Another great feature worth mentioning is All-in-One wireless keyboard’s integrated touchpad. Thus, no need for any extra mouse with this wireless keyboard with trackpad. With all these features it’s one of the powerful wireless keyboards with touchpad in 2019. Rii is known for its mini and compact wireless keyboards. This ultra thin wireless keyboard Rii Mini K12 comes with a clean finish. It’s complete back portion is made of stainless steel. It gives it a sturdy built and shiny look. This light and slim Rii wireless keyboard weighs just 0.705lbs/320gm and is 13 mm in thickness. It runs on a quick and reliable 2.4GHz wireless connection with a range of 10 metres. The wireless keyboard is compatible with Raspberry, Mac, Linux, Android and Windows. 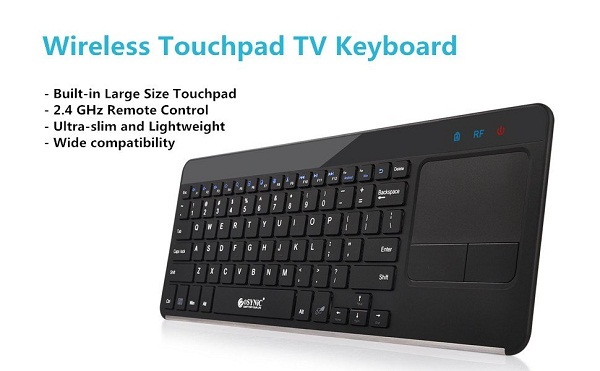 It’s a Smart TV compatible wireless keyboard. Rii K12 qwerty style keyboard supports various shortcuts for media and application. No just smart TVs you can also connect this wireless keyboard to PSPs. If you are looking for wireless keyboard with a mouse or a wireless keyboard with trackpad, you would be glad to read the next line. The Rii Mini wireless keyboard supports touchpad. Thus, you can click, drag, zoom and roam freely right from your keyboard. Thanks Bablofil that you find it helpful. Keep visiting. Next story Amazon India: GREAT INDIAN SALE 11-14 May 2017. Previous story Top five best office projectors with 1080p resolution) under $200.